The sample size specter haunts me. 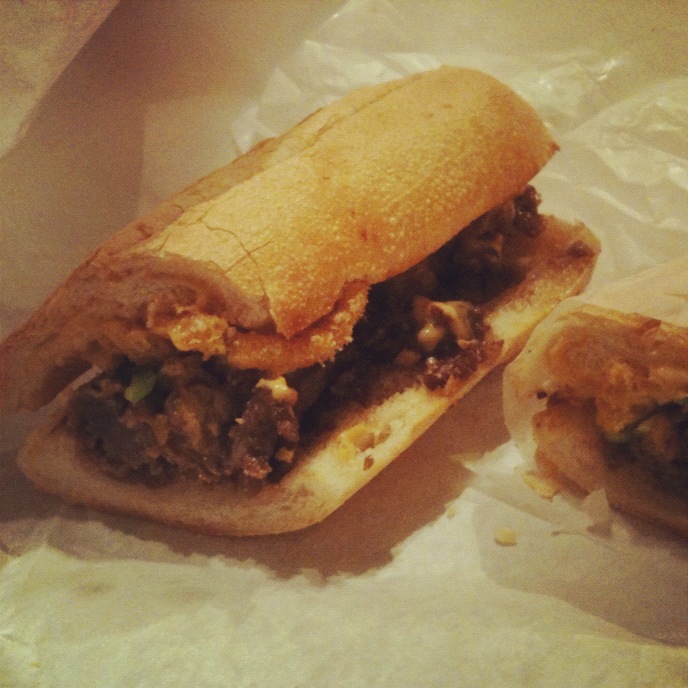 The sandwich: Cheesesteak from No. 7 Sub, Plaza Hotel, 59th and 5th in Manhattan. The construction: Thinly sliced steak with miso whiz, pickled jalapenos and Funyuns on a toasted hoagie roll. Important background information: I’ve been hearing great things about No. 7 Sub and meaning to try it since I first started writing about sandwiches here. But until a few weeks ago, I had no idea they had a location in the basement of the Plaza Hotel, about seven blocks from my office. Also down there: a Luke’s Lobster, purveyor of Josh Thole’s favorite sandwich, and an outpost of Billy’s, my favorite bakery in the city. How it tastes: Either good enough to be a borderline Hall of Famer, decidedly too salty, or — most likely — somewhere in between. I had this one twice, and the experience reminded me how silly this whole enterprise of rating sandwiches really is. Please do not take the numbers I throw out too seriously. I suspect that if I went back and tried every sandwich I’ve reviewed here, I might return with an entirely different Sandwich Hall of Fame. Anyway, the first time I ordered the cheesesteak, I watched the man behind the counter carefully construct it — toasting one side of the bread first, plain, then adding the steak and miso Whiz to the other side and toasting that, then painstakingly laying the remaining ingredients in an even pile on top and completing the sandwich. I can practically guarantee that Funyuns have never been handled with such great care. There wasn’t an overwhelming amount of steak, miso Whiz or jalapenos, but it all worked that first time. I could pick up the distinct flavor of miso and the spice of the peppers on top of the slight chewiness of the steak. It’s almost unconscionable to consider calling a sandwich with Funyuns on it “delicate,” but that’s kind of how it tasted. None of the flavors were overpowering, it wasn’t too greasy, there was an interesting variety of textures. The second time, this cheesesteak almost tasted like a caricature of the sandwich I had the week before. I don’t know what went wrong in the process (or what went right the first time), but I suspect the proportions were off. By taste, at least, there was less steak and fewer jalapenos and way more miso Whiz and Funyuns. The Funyuns didn’t present as much crunch but the salt remained, and the extra miso Whiz meant that saltiness and miso flavor dominated the sandwich. Still really good, mind you, just nowhere near as delicious as the one I had the week before. What it’s worth: $12, which isn’t cheap for cheesesteak, Funyuns or no. Both halves make for a pretty big meal, though. How it rates: 80 out of 100, the mean of the two versions I had.